ion-packed production of the world-renowned Team Ninja development team with the game design talents of the creators of the original Metroid. Metroid: Other M is a dramatic new direction for the Metroid franchise, and a bold new blend between cinematic, storytelling and interactive entertainment. FreezeME is a 3D platformer in the style of the 90s-era, but wait! There is a twist! The main character “R” has one special tool – a camera around her neck. This camera allows her to literally freeze the objects she photographs! Tachyon Project is an action packed dual-stick shooter driven by a story. Through the story mode you'll progressively unlock all the weapons, secondary weapons and perks available to configure your ship. You'll need them to face the increasingly hard enemies you'll find with over 30 different types (including 4 bosses). In Tachyon Project you take control of Ada, a software program that has taken conscience and that was designed to hack into the most secure servers on Earth. After some rather mysterious events, Ada is thrown out of the test server where it was living and out into the Internet, but when she tries to go back there she finds she's unable to. She'll then start a journey to uncover the truth behind what happened to her creators, which she considers her parents. In the process she'll find out that things were a bit more complex than she initially thought. One night an old man found a mysterious mask; a key to a world hidden on the other side of the rain. It was destined for a hero, a champion, a saviour, but the old man was just a beggar. Uncover the secrets held within the mask as you journey through strange and beautiful lands wielding god like powers over the world around you and discover the truth behind who The Beggar really is! The Beggar’s Ride is a unique and innovative Platform Puzzle Adventure Game where the player can manipulate the environment to solve puzzles in a deep and intriguing story of discovery. Chompy Chomp Chomp Party is a fast and frantic game for up to 9 players. Each player controls a different coloured Chompy and has to chase and chomp the other Chompies in a variety of game modes and arenas. Ultimate classic RPG where a young knight must fight destiny through the darkness that lurks in history! Kline, a novice High Beast Knight is sent on reconnaissance into Laft, the Earth-Depths, where he comes across Alia, a Battle Maiden who has suffered terrible injuries and is close to death. In order to help her, he forms a partnership with the God of Death, Rooselevy. Alia lives, but in return the young knight must give up his life... In a world on the brink of war, the newly acquainted duo must fight destiny itself in order to save the world from the ever creeping darkness that is threatening to consume everything, and once and for all restore the balance of the world. Long story short. I&apos;ve bought DLC for the game, most of it if not all. ..And I&apos;ve ignored it in the end. Take it for what you will. The only thing I played consistently was the Free XP/Money maps because I&apos;m a cheater scumbag who&apos;s only in it for power-leveling/supports. It&apos;s...been ages since I played tbh. Sounds right tho. But for instance the Hot Spring missions for example. I have them. Never touched. I got for the sake of completion I guess but...I&apos;m just not that fussed. 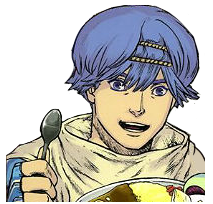 I may play the missions involving Lucina and the kids in Bad Future eventually but I&apos;m in no great rush. Long story short once again. It really depends on the player. I personally say "meh" in the long run. As for you, I can&apos;t say. But deals won&apos;t last forever. Another point to consider. No Chronicles of Teddy for EU apparently. That&apos;s disappointing as I was really looking forward to it. When I eventually gave my copy months later to Amazon UK I got a £3 gift voucher and chuckled at the 42 new copies on sale for the exact same price. I love that story. Can&apos;t you tell?